It may not feel like it yet but the holidays are quickly approaching! 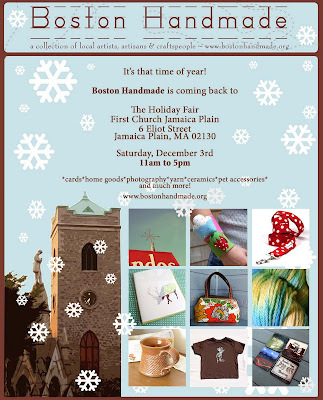 And that means... Boston Handmade will once again be exhibiting as a group at the annual First Church Jamaica Plain Holiday Fair! We will be up on the stage selling everything from stationary to hand-dyed yarn, photography, home goods, and much more! We will even be selling our very own Boston Handmade t-shirts as well. So go ahead and mark your calendars for Saturday, December 3rd. We look forward to seeing you there!